Twitter have some awesome tools for saving developers time and boosting productivity. One such tool is Twitter Fabric. Fabric is a collection of tools like Crashlytics (Crash Reporting), Mobile Analytics, Digits and much more. Sadly, their official SDK’s are not yet available for Xamarin, still, there is a Xamarin binding which works well. Thanks to Michel Moreira for this binding. This binding is available as Nuget Package, so getting started with this plugin is so easy. 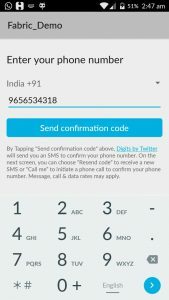 Steps to integrate Digits to your Xamarin.Android app. Step 2: Sadly, for getting API Keys, you need Android studio. So make sure you have Android Studio Installed (just for the sake of API keys). 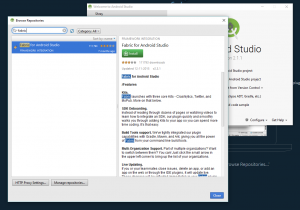 Step 3: In Android Studio, select Plugins-> Browse Repositories -> Search for Fabric Plugin, Install it, Restart the IDE. 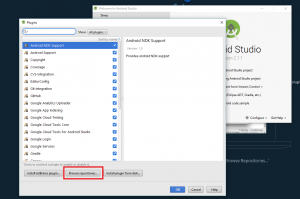 Step 4: Start a Blank New Project with the name Intended for your Xamarin.Android project. 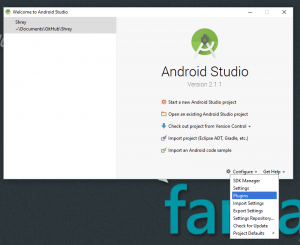 Step 5: Click on Fabric Icon in Android Studio, Login to Fabric with your account and select Digits from the kits listed. Step 6: Create Digits Account, and get the API keys obtained from AndroidManifest.xml file and MainActivity.java. Step 7: Build the project in Android Studio. Once the app is built from Android Studio, your app gets listed in Fabric Dashboard where you can customize the One Time Password message, and get all they API keys. Step 10: Open your project, Right Click your project in Solution Explorer and Select Manage Nuget Package. Step 11: Search for Digits by Michel Moreira, and Install the package. Also, paste the meta data information to AndroidManifest.xml under application node. Step 14: Initialize fabric in your OnCreate method. Step 16: There are multiple ways to authenticate. You can theme your default button or have custom Authentication action from anywhere in the program. Step 17: For example, you need to authenticate mobile number on a button click, just have Digits.Authenticate(this); in your button click event. and in your Main Activity, set the callback of the button to the current class. Step 19: Handle Success and Failure methods. Success method will be called when your authentication using mobile number if verified and it will have the details in DigitsSession p0 variable or p1 gives the mobile number. Failure method will be called if the number cannot be authenticated or User cancels the process. Step 20: Run and see it in action. Shout out your suggestions, feedback and doubts in comment section below. Credits: Michel Moreira‘s Fabric Binding for Xamarin. Awesome post. Step-by-step detailing really helps. I’m getting deployment error when I use AppCompatActivity instead Activity. My question is Why I can’t use the AppCompatActivity.? Hello I’m having an issue with Application Theming. The errors I get is. Can you paste the whole page code in gist? Or refer the sample code. Is the nuget properly installed? in relse mode at enter phone number screen after click send code tooltipe that try agine. I tried but fabric.sdk could not able to add.